In our previous blog, we highlighted a handful of makers whose work we find inspiring. At Holster Builder, we’re proud to offer all of the holster making supplies you need to craft a holster whether it’s for yourself or for your business. There are several places that we draw inspiration from, but one place we always turn to is the maker community. We’re lucky to live in a day and age where people are starting to rediscover the joys of making things. After all, as Henry Ford once said, “Chop your own wood and it will warm you twice.” We couldn’t agree with that sentiment more. 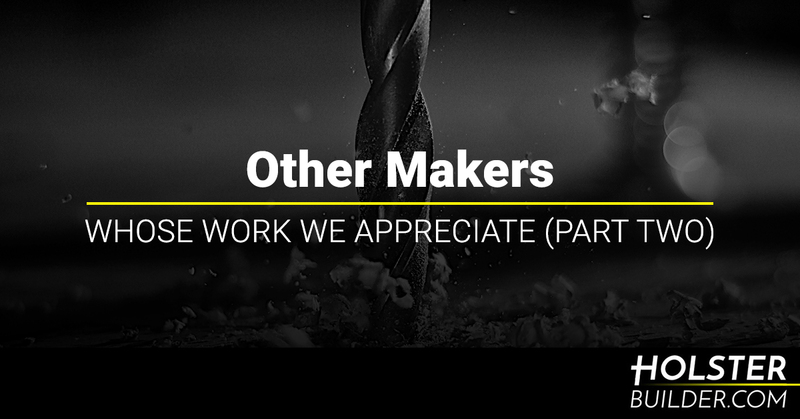 We’ve already highlighted great makers like Jimmy DiResta, Chris Salomone, and Anne of All Trades, but in today’s post we’d like to bring your attention to a few more people who are worth being inspired by. Keep reading to learn more! “Who is Yvon Chouinard?” You might not recognize his name, but chances are you know about the brand he created — Patagonia. Their approach to business is to build the best product which is something we can absolutely get behind, and according to their website, “function, repairability, and, foremost, durability” are at the top of their list of goals for their products. The podcast How I Built This interviewed Chouinard back in 2016 and host Guy Raz asks him about everything from the history of the brand to his outlook on creating a product that will truly last for a lifetime. It’s interesting and insightful, and regardless of your interests, we think you’ll learn something. Tamar over at 3×3 Custom is always fun to watch on her journey towards making things. Her YouTube channel is an awesome resource, for anyone who wants to build furniture for their homes, and her approach to her projects is inspiring because not only does she share insight into her designs, but also tips for what she does when she encounters problems. Recent projects include a DIY balance board, modern vanity desk, stackable salt cellars, a keyboard stand, a tea box made out of walnut and brass, and even a ping pong table. Whether you have an entire shop full of tools or you’re just interested in watching an interesting person make something cool by hand, Tamar will put a smile on your face. If projects like a motorized coffee table with secret 4k movie projector, a rustic bookshelf, a DIY sofa bed, outdoor chairs, or floating shelves are up your alley, Glen from DIY Creators is a person to keep your eye on. His approach to making things is inspiring, and his projects always perfectly balance entertainment and instruction. Glen shares a number of different projects, so you’re sure to find something that catches your eye no matter what you like to build. His easy-to-follow projects are a great way to gain insight into his design approach, which every maker out there is sure to appreciate. Perhaps you love a good project. Maybe you’re just interested in building a holster. Either way, Holster Builder is your source for the holster making supplies that you’ll need. Whether you’re looking for kydex sheets for sale, belt attachments, or something else entirely, our goal is to provide holster makers with all of the things they need to make a holster they’ll be proud of. Whether you’re making a holster for yourself or as a part of your business, we have everything you need to get it done right. Shop our entire selection today or feel free to contact us with any questions!